Are you looking to have whiter teeth, fix crooked teeth or simply replace your tired, worn out and old looking smile? Today, you have the benefits of modern dentistry techniques that can literally take years off your face and quickly and easily give you the smile you have always wanted. Dr. Calvo knows that there is both an art and a science to when it comes to smile design. That means combining cosmetic artistry with modern dental materials and expert training. 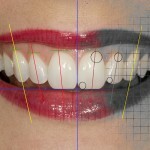 Dr. Calvo applies the principles of smile design to every patient. While the principles remain the same for each case, each patient has different visual aesthetics and that is why no two smiles will ever look the same. Think of your smile like a picture and your facial features (the lips, cheekbones, etc) as the frame… you want the picture to fit and look beautiful in the frame. Working with an Accredited AACD Lab Technician, Dr. Calvo will design your perfect smile, customized just for you. Using a composite material, she will do a “mock up” right over your own teeth so you can see and feel your new smile instantly and know exactly what it will look like before starting any procedures. Ask about her Beautiful Smile Guarantee.